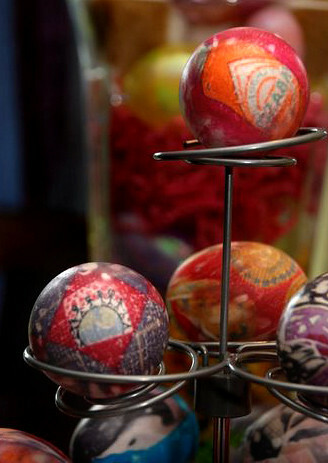 Last year, when we bragged about what we thought were pretty cool Easter eggs, our friend and reader, Stacey, politely replied with the equivalent of a walloping Easter egg trump card. I admit, they are way cooler than mine. Thanks for the tip, Stacey! This aint no ordinary building. 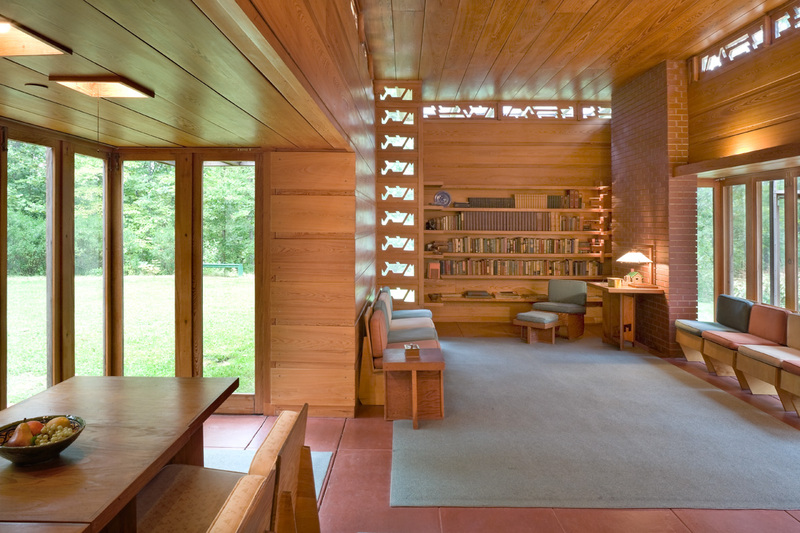 In case the smooth lines, ordered space and airy perspective didn’t lead on, this masterpiece building is one of many by world-renowned architect and designer Frank Lloyd Wright. Built in 1939, the Pope-Leighy House is now a museum. It is literally a three minute drive from my front door and this weekend I took the family there to visit. It wasn’t until we paid for admission (a small price, but at a separate location) that we realized it was a guided tour on schedule every hour. Most of the fellow patrons were older. And none, smartly, had their kids with them. My wife and I knew that our two-year old wasn’t going to make it. He was already starting to walk around and fuss as the small crowd of well-dressed visitors gathered just outside the house before the tour started. So my wife decided she and he would tour the nearby gardens and grounds instead, while our 5-year old and I stayed for the house tour. Although it wasn’t posted anywhere, in hind sight, I’d say an architectural tour is probably an 8-year-old-and-up tour. Still, even at five, Philo hung in there. He asked alot of interesting questions and took in a good part of what the tour guide said. And I think he got it, you know, actually being in a house built by a world-famous builder and artist. If not, I’m sure he will someday. What he did ask though, several times after we left, was about a very small and obscure Lincoln Log cabin that was set up on a table in the far corner of the living room. I wondered about it myself, though neither of us asked the guide. Because they are from a much older generation, and he never saw Lincoln Logs before and wanted to know what they were. That was easy, and I told him. But I wondered why they were there, intentionally, as decor amidst the masterpiece. In any case, he now wants Lincoln Logs and I think it’s cool that when he gets some, he’ll associate them with a house that Frank Lloyd Wright made. Of course, I was and still am, over the moon from the visit. I have always been a patron of the arts – and when it comes to architecture, there are few if any that surpass the creative genius of Wright. There are really no words to describe the sense of pure artistry and excellence found inside one of his spaces. Experience is the only way. The full span of his work stretches across five countries and 37 U.S. States. Check this complete list of works to locate – and hopefully visit – a masterpiece near you. I hope to see many, many more myself … when the boys are older, of course. Meanwhile, we’ll be shopping for those Lincoln Logs. I always look for ways to learn more, as both a parent and professional. So when our local parent-teacher association asked for volunteers to help coordinate annual picture day at school last week, as a dad and photographer, I couldn’t resist. Now for me, when it comes to volunteering, I have witnessed, first hand, the power of instant Karma. It might be the generalist in me, the lover of all things, but I always get a great deal of insight and enjoyment from each experience I contribute to. There’s always something great I get in return, when I give a part of myself to any cause. Picture day was no exception to the cosmic law of give and take. As anyone can imagine, photographing hundreds of kids, from kindergarten to 6th grade – in one day – is a major undertaking. 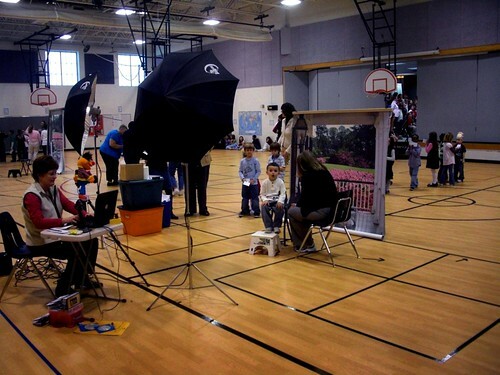 I was one of nearly a dozen volunteers to assist the faculty and a corps of about 12 photographers at four portrait stations in the gymnasium. The biggest insight, professionally, was how much organization and process is going on, behind the flowery scenes and flash bulb pops. We’re talking about many, many kids here, all at once and one right after the other. They each have their little envelope of money, with their package selected, and a corresponding card with a bar code. 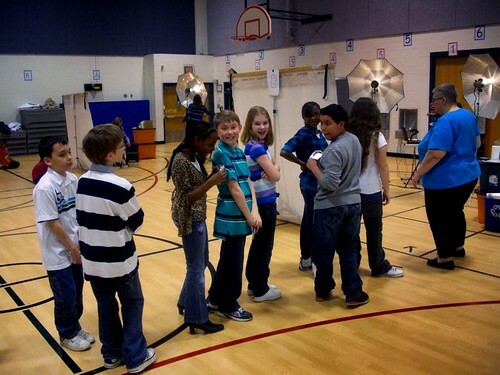 They start up on stage, in the back of the gym ,where they get their class group photo taken, and then the kids are paraded out onto the floor to get their individual portraits. This is mass production photography. It’s up to the photographer to keep track of who’s who in the picture and make sure the envelope matches the person in the photo, so that each family gets the right prints back from the lab, with the right amount of photos enclosed. These picture-day people have been doing this for a long time – you know, you remember getting it done too – and they have it pretty well figured out by now. But as someone who is always studying others in my own industry, my head was spinning seeing hundreds of envelopes and little cards and bar codes flying around. But he’s right. To do that many photos in such a short period of time – and to keep it all creative – would be a tall order. And he said, even if it was possible to be fancy, the extra time and effort for creativity on such a scale would drive prices way out of most families price range. It was a super valuable lesson for me. For a while, I toyed with the idea that I might expand my business model to include annual school photos. Suffice it to say I no longer toy with that notion. I’ll stick with smaller groups in better settings, like families in their homes or kids at the park, which on that scale, allows both creativity and affordability. The hours flew by on the big round clock, hanging on the gym wall. 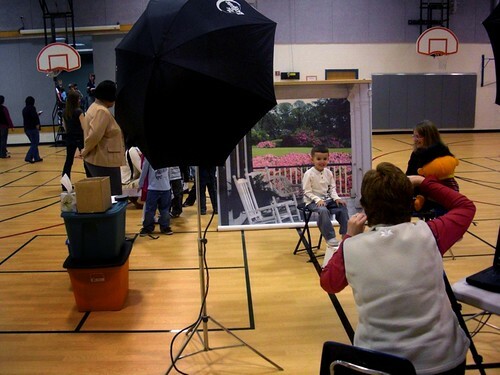 And once the last class was process for pictures, I realized how much I really like kids. Some folks don’t. I get that. Others like their own kids, and that’s good they should, but they don’t care for other people’s kids so much. But I just like ’em. I am inspired by their curiosity and their willingness to learn. I enjoy their enthusiasm. And I know quite well that kids fib, lie and make up tall tales by the dozens – still – they have a certain honesty about them that most adults have lost or misplaced. It’s a simplicity. It’s the ability to participate with and see things for what they are, without making strong or analytic assertions about them. 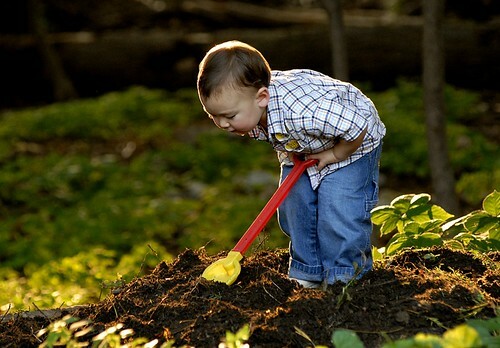 Kids have the ability to be in the present, not planning the future or replaying the past. They don’t worry. They smile for real, from ear to ear. Present in the moment, they make enjoyment seem effortless. It’s a goodness and a realness that as we grow into adults – for some reason – we lose. I lose mine more often than not, but I always get it back in the company of kids.